(16382, Frederick S. Barde Collection, OHS). Situated at the approximate longitudinal center of interior North America, Oklahoma bridges the eastern and western United States. The state reaches from the moist pine and hardwood forests of the Ouachita and Ozark mountains of the southeast to the arid shortgrass prairies and piñon pine-juniper mesas of the Panhandle, encompassing numerous additional habitats within the state's borders. The resulting diversity of weather and vegetation allows for the occurrence of a wide variety of birds. With more than 215 bird species recorded as having nested within its borders and a total of more than 455 species cataloged as having occurred within Oklahoma, this state ranks well above average for the number of species it has hosted. Oklahoma experiences four distinct seasons, and with each comes change in the numbers and kinds of birds present. About one-fourth of Oklahoma's regularly occurring species are resident year round. Another one-fourth are transients in the spring and/or fall, just over one-fourth are summer residents, one-fifth are winter residents, and the remainder are occasional visitors to the state. In addition to these species of regular occurrence, a number of birds not normally present in the state have been documented by ornithologists and birders. The state of Oklahoma is within the center of abundance for the breeding ranges of a number of bird species, including northern bobwhite (Colinus virginianus), dickcissel (Spiza americana), and eastern meadowlark (Sturnella magna). Oklahoma harbors populations of species spotlighted nationally as of significant conservation concern, including the greater and lesser prairie chicken (Tympanuchus cupido and Tympanuchus pallidicinctus), black-capped vireo (Vireo atricapillus), and Henslow's sparrow (Ammodramus henslowii). Oklahoma is also an important wintering area for a number of birds, including the red-tailed hawk (Buteo jamaicensis) and Harris's sparrow (Zonotrichia querula). Most of these species are dependent upon grasslands, a habitat type once covering some 17 percent of the North American landscape but which has now been altered and reduced to a greater extent than almost any other habitat. The remaining large expanses of native grassland in Oklahoma provide critical habitat for these and other grassland birds. At the beginning twenty-first century several additional bird species were under the watchful eye of biologists due to reduced, diminishing, or threatened populations in Oklahoma or within the species' larger range. The red-cockaded woodpecker (Picoides borealis), Swainson's warbler (Limnothlypis swainsonii), and interior least tern (Sterna antillarum) are all being closely monitored in the hope that they will remain a part of Oklahoma's bird life. Several bird species that once had a noteworthy presence in Oklahoma are now extinct. The passenger pigeon (Ectopistes migratorius), at one time the most numerous bird in North America, occurred in eastern Oklahoma at least through 1889 before succumbing to extinction in 1914 due primarily to excessive hunting. The Carolina parakeet (Conuropsis carolinensis) once occurred in eastern Oklahoma, but it too was extinguished in 1918. The ivory-billed woodpecker (Campephilus principalis) was a resident of bottomland forests of southeastern Oklahoma until about 1884 but is now very likely extinct. In contrast to these lost or declining species, a number of birds have restored or increased their populations in Oklahoma. The southern bald eagle (Haliaeetus leucocephalus) experienced a significant population decline throughout the southeastern United States in the 1950s, 1960s, and 1970s, due largely to use of the chlorinated hydrocarbon pesticide DDT. In 2001 over thirty pairs were nesting in Oklahoma, thanks to a national prohibition on the use of DDT, as well as a highly successful reintroduction effort made during the 1980s. Even more dramatic are the fortunes of the wild turkey (Meleagris gallopavo) in Oklahoma. Considered an abundant resident throughout the main body of the state, and present but less common in Cimarron County during the mid-1800s, the turkey population dwindled significantly by the turn of the twentieth century. 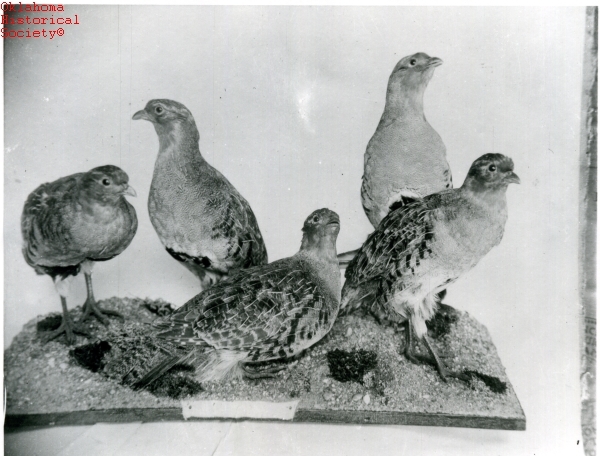 A statewide survey in 1941 documented a mere 220 birds in just six southeastern Oklahoma counties. Subsequent protection from over hunting, along with better land management practices and careful restocking efforts, restored turkey populations to harvestable levels statewide. Such conservation efforts are worthwhile biologically, but also economically. The monetary value of natural pest control provided by birds is hard to calculate, but enormous. Birds also produce direct and significant contributions to the state's economy in a variety of measurable ways. Revenue comes from sales of gas, meals, lodging, ammunition, and other incidentals purchased during these bird hunters' activities. Nonhunting activities related to birds such as bird feeding, bird photography, and travel to see birds generated in excess of $55 million in retail sales for Oklahoma in 1991. The majority of bird species regularly occurring in Oklahoma can be seen by frequenting a handful of locations that are well known among the state's birders, provided visits are made at the proper seasons. These locations include Salt Plains National Wildlife Refuge in Alfalfa County, Hackberry Flat in Tillman County, Red Slough Wetland Restoration Area in McCurtain County, the Black Mesa area of western Cimarron County, Wichita Mountains National Wildlife Refuge in Comanche County, Tallgrass Prairie Preserve in Osage County, and Ouachita National Forest in Le Flore and McCurtain counties. The first three areas are especially good for viewing waterfowl, wading birds, and shorebirds, and the other areas are good for viewing a variety of songbirds. Most of these sites are also good for observing birds of prey, particularly during winter months. Winter visits to major reservoirs may provide views of large numbers of gulls and waterfowl. Viewing opportunities are by no means limited to these locales, however, as numerous species can be readily observed statewide, and many will come to birdbaths and feeders. Several organizations in Oklahoma are solely devoted to birds and bird study. The oldest and largest has been the Oklahoma Ornithological Society, established in 1950. It publishes a peer-reviewed journal, with papers addressing ornithological topics pertinent to Oklahoma, and sponsors the Oklahoma Bird Records Committee, which reviews and maintains distribution and occurrence data on Oklahoma birds. The George M. Sutton Avian Research Center is a nonprofit organization in Bartlesville affiliated with the Oklahoma Biological Survey at the University of Oklahoma. Established in 1983, the Avian Research Center conducts research on birds in Oklahoma and worldwide and coordinated the project resulting in the Oklahoma Breeding Bird Atlas. Several communities throughout the state have independent bird clubs or local chapters of the National Audubon Society. F. M. Baumgartner and A. M. Baumgartner, Oklahoma Bird Life (Norman: University of Oklahoma Press, 1992). Margaret M. Nice, The Birds of Oklahoma, Publications of the University of Oklahoma, Vol. 3, No. 1 (Rev. ed. ; Norman: University of Oklahoma Press, 1931). Oklahoma Bird Records Committee, Date Guide to the Occurrences of Birds in Oklahoma (3d ed. ; Tulsa, Okla.: Oklahoma Ornithological Society, 2000). Dan L. Reinking, ed., Oklahoma Breeding Bird Atlas (Norman: University of Oklahoma Press, 2003). George M. Sutton, Oklahoma Birds: Their Ecology and Distribution (Norman: University of Oklahoma Press, 1967). Dan L. Reinking, "Birds," The Encyclopedia of Oklahoma History and Culture, https://www.okhistory.org/publications/enc/entry.php?entry=BI011.